PVH (PVH) shares have rallied over 40% this year, tracking above a rising 50-day moving average to their September high. That positive momentum has moderated over the last month and the trajectory of the stock price has flattened. Currently, the 50-day moving average and trendline support in the $123.50 area are being tested, and the technical indications are pointing to a breakdown. The daily chart shows the steady rise in the stock price going into the September high and then the sideways price movement over the last month. During this time, the relative strength index has being moving lower and is below its center line, reflecting the recent loss of positive momentum. Daily moving-average convergence/divergence is overlaid on a weekly histogram of the oscillator and is crossing below its center line on both timeframes. This is an indication of a loss of positive short-term momentum and trend direction. The two indications that suggest the move lower could be volatile are the Bollinger bandwidth indicator and the graph of the percent difference between the 50-day and 200-day moving averages. The diversion between the two key technical averages is wide; in fact, it is the widest it has been since 2013. This implies a reversion of the 50-day average back toward the 200-day average, which would mean the stock price would have to move considerably lower. The Bollinger bandwidth reading is extremely low, reflecting the recent lack of volatility. Periods of low volatility like this are often followed by periods of high volatility and, if that is the case, a breakdown from current levels could not only be deep but also could be fast. The Russell 2000 Small Cap Index is up over the last 52 weeks, but it has lagged the broader market indices, under-performing the Nasdaq Composite by 50% in that time. 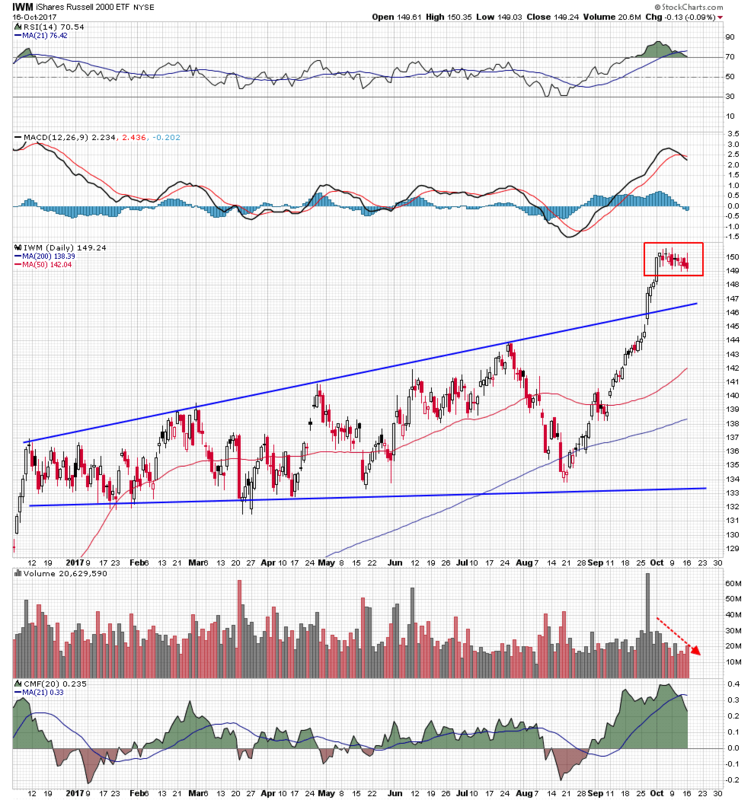 This disconnect could be about to accelerate as the iShares Russell 2000 ETF (IWM) chart illustrates, and the danger is this continuing small-cap deterioration will start to drag on the broader market. 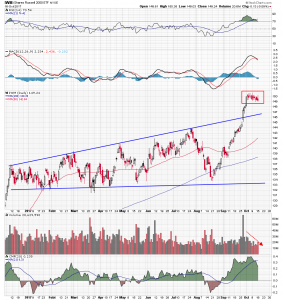 The IWM spent most of this year making a series of higher highs after bouncing off horizontal support in the $133 area. While the price movement is contained in defined trend lines, it has become more volatile as it has developed and could be interpreted as a broadening top pattern. The premise of the pattern is that the smart money is exiting as the first new highs are made and the later volatility is the result of participation by the general public. This is a dangerous time because when the institutional distribution is over, there will be no more buyers, and the cycle will collapse. 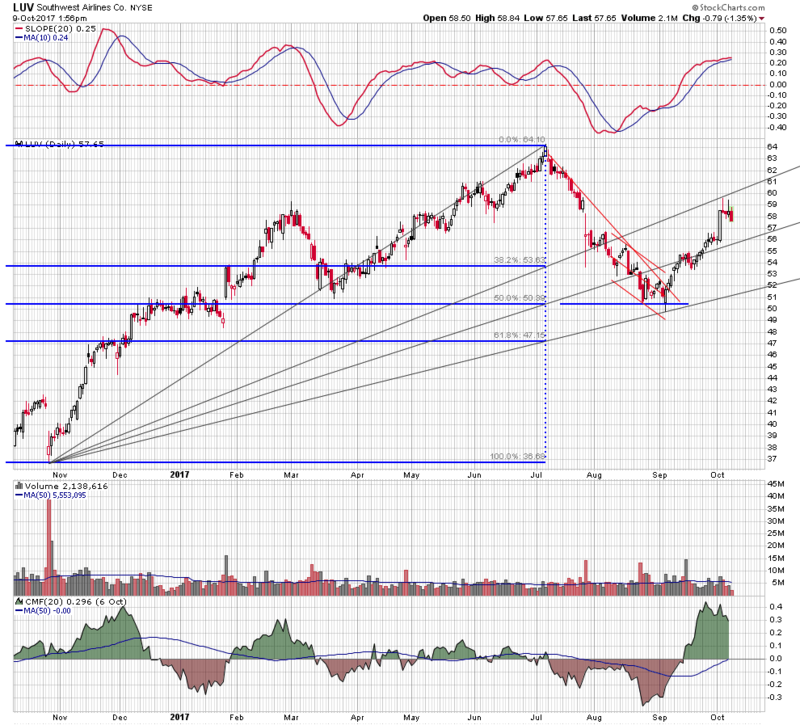 The August low took the IWM back to its January level and the sharp rally that followed the successful retest of pattern support accounted for most of the year’s gains. That move returned the fund price back up to triangle resistance and last month a single-day surge in positive volume powered it through resistance. This month, however, the bullish momentum has faded and the IWM has been trading in a narrow sideways range. The individual candles that have formed in this consolidation range are of particular concern. A number of them have high wicks and small real bodies, a sign of uncertainty at new highs, and the technical indicators reflect this uncertainty. The relative strength index has crossed below its 21-period average in its overbought zone and moving average convergence/divergence is making a bearish crossover. These readings represent a loss in short-term positive price and trend direction. While it is still well into positive territory, Chaikin money flow has dropped below its signal average, and overall volume has fallen off. These readings do not support a continuation of the uptrend. 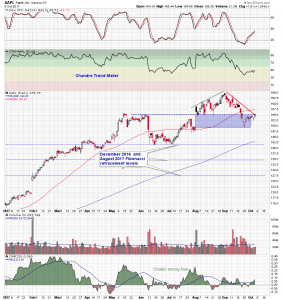 The September breakout on the IWM chart and the weak price action that followed suggests the breakout was an exhaustion move and that the small-cap sector is headed lower. It could be a volatile downdraft as the weak hands that powered the move quickly abandon their positions. That would get the attention of the broader market and that is the danger. Investors are having trouble digesting the news that Honeywell (HON) is spinning off its transportation and home industries businesses to concentrate on its aerospace operations. The stock price has pulled back off its highs and looks like it is headed back down for a retest of its 200-day moving average. If that were to be the case, the pullback would allow time for the market to absorb recent company news and re-energize the long-term uptrend in the stock. It would also offer a good risk-reward long entry opportunity. One of the fundamental issues that is translating into technical uncertainty may be that back in February 2016 when Honeywell proposed its failed takeover of United Technologies, the company said the purchase would create a “well-balanced portfolio” of aerospace, home and energy products. Now it seems to have abandoned any effort to diversify and instead will focus just on its aerospace sector. Another potential issue could be that investor Daniel Loeb of Third Point, has been pressuring Honeywell to spin off its aerospace operations and focus on the remaining parts of its business. The announcement from the company Tuesday is the exact opposite of that proposal. The easiest and most profitable way to follow how all this fundamental information plays out may be to simply monitor the price action on the Honeywell daily chart. The stock has been trading higher and above its rising 50-day moving average for the last five months. It broke out of a wedge-like formation shortly after the United Technologies and Rockwell announcement in early September, and has continued sharply higher. That upside momentum, however, is now fading. 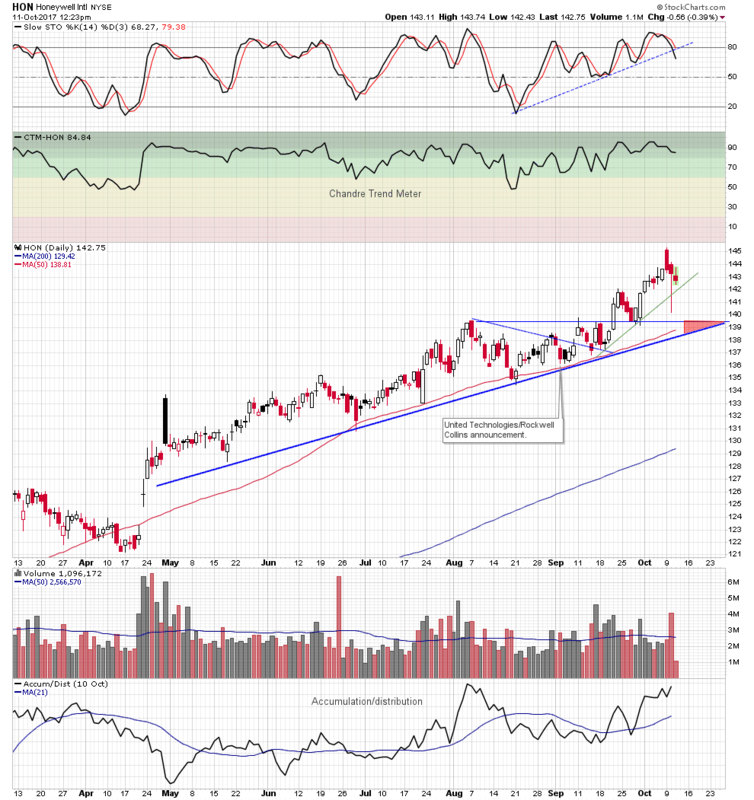 A large dark candle formed on Monday at new highs, and Tuesday’s news regarding the spin-off of divisions saw some intraday volatility; Honeywell’s stock price dropped sharply at first but then closed up near its high of the day. At this point in Wednesday’s session, it is trading lower and below a large upper candle wick. These three consecutive candles have bearish implications. The stochastic oscillator is turning down and out of its overbought condition. This is a short-term negative momentum indication but should be measured against the strong reading on the Chandre Trend Meter. This indicator, which uses multiple moving averages on multiple time frames to assign a numerical value to trend strength, is reflecting the longer-term bullish uptrend. 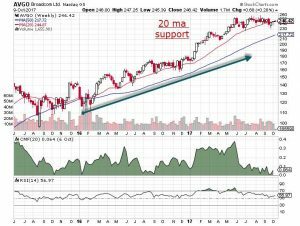 Honeywell shares are pulling back off their recent highs and likely to retest the zone of support on the daily chart delineated by the long-term uptrend line, the 50-day moving average, and horizontal support supplied by the August high. If that turns out to be the case, it would be a good risk-reward buying opportunity with an initial stop just under the zone. The implication being that the long-term trend is intact and the stock is ultimately headed higher. Cramer’s charts suggest these semiconductor stocks can still soar from CNBC. With technology stocks on fire this year, Jim Cramer decided to go Off the Charts with Bob Lang to take a closer look at the semiconductor sector. Lang is the founder of ExplosiveOptions.net and is a contributor to TheStreet.com’s Trifecta Stocks newsletter. Lang noted that the the VanEck Vectors Semiconductor ETF (SMH) is up 1,200% since the 2009 lows, dwarfing the gains in the S&P 500 over the last 8 years. That suggests that there are more semiconductor companies besides NVDIA (NVDA) which are performing well. 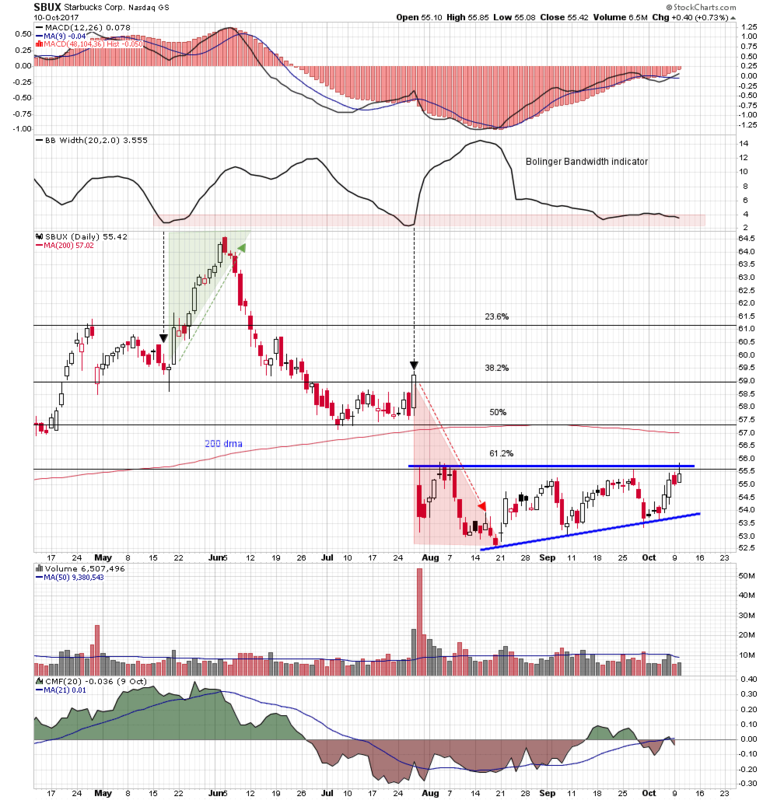 Cramer and Lang started with a chart of Intel (INTC) , the old guard chipmaker. Shares of Intel shot higher a month ago, and the stock’s now at its highest levels since the dot-com collapse in 2000, according to Lang. The stock’s strength has brought much of the semiconductor index with it. And the Chaikin Money Flow Oscillator, a measure of buying or selling pressure in a stock, turned from negative to positive three weeks ago and has surged since. That tells Lang that big institutional buyers are piling into the stock. Lang also notes that turnover has been strong, with shares up 20% since Intel’s last earnings report, a very large move for a company with a big market capitalization, such as Intel. The company reports next week, setting up the possibility for a decline given the big run shares have already seen. Cramer says if that happens, it should be treated as a buying opportunity. Not all semiconductor stocks have been performing well. 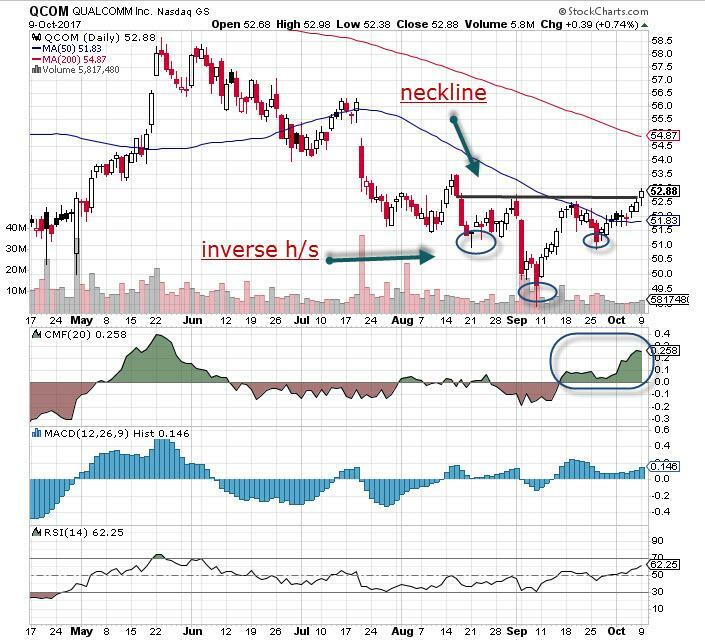 Qualcomm (QCOM) , which makes communication chips and the software used in a lot of cell phone technology, has repeatedly disappointed bulls this year. But that may be about to change. Lang said Qualcomm’s chart shows it could be ready to move higher. It has made an inverse head and shoulders pattern, a reliably positive pattern. That could set it up for a quick trip to $56, according to Lang. The stock has already broken above a ceiling of resistance at $53, and the relative strength index has been rising. In addition the Moving Average Convergence Divergence indicator is bullish as well as the Chaikin Money Flow oscillator. Heavy option flow in the December 55 and 57.5 calls also indicates many buyers think Qualcomm will go to at least $60 by the end of the year. Qualcomm reports in three weeks. 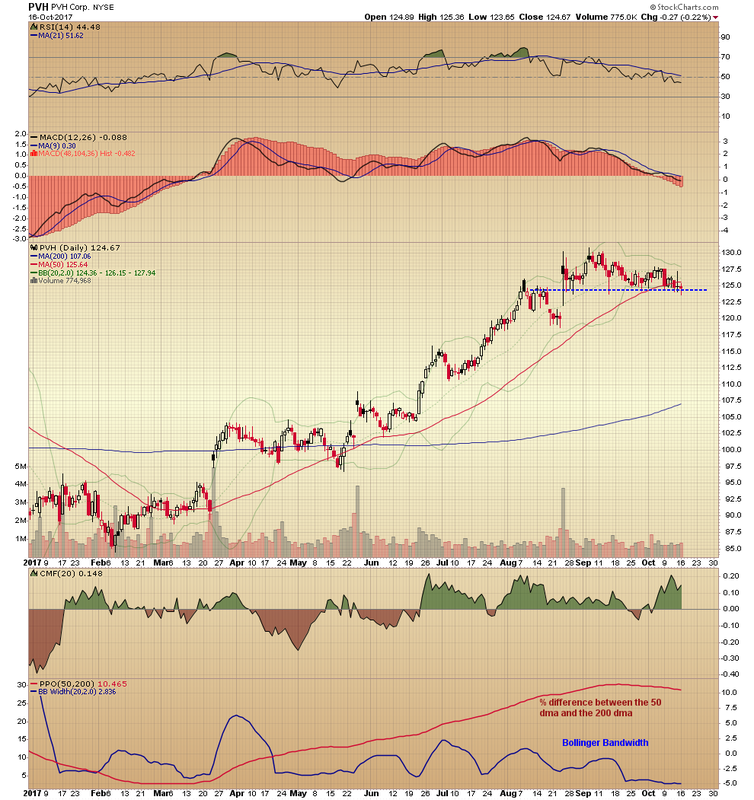 Lastly, Cramer and Long looked at Broadcom (AVGO) , formerly known as Avago. Broadcom has benefited from a series of acquisitions and the stock is now up 120% just since the beginning of 2016. 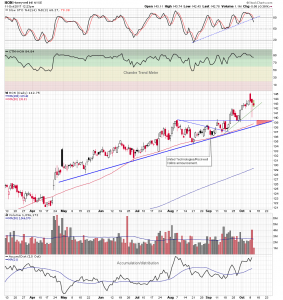 Lang notes that Broadcom has made a series of higher highs and higher lows, with the stock’s 20-week moving average acting as a floor of support. In addition, Broadcom has made a bullish flag pattern here — where the stock trades sideways after a big rally in order to digest its gains. 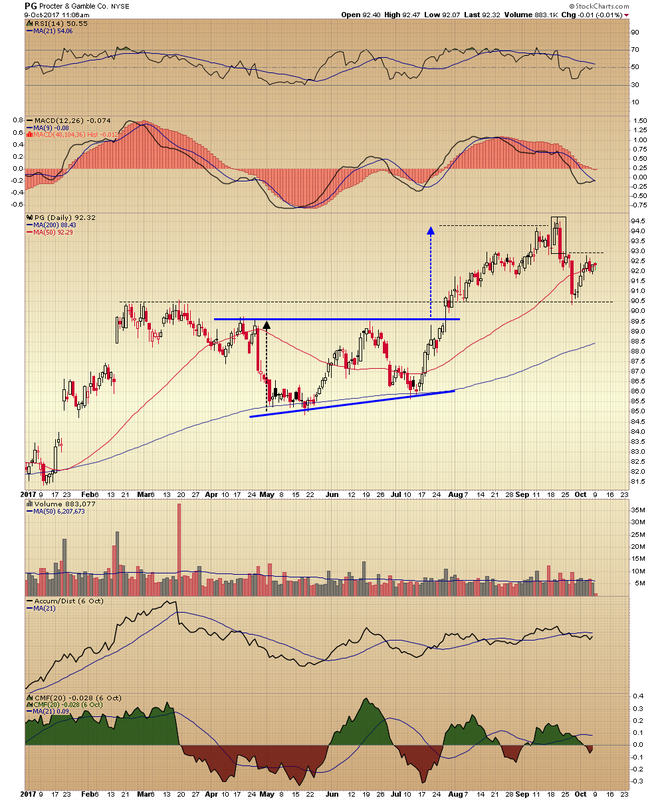 Typically, this kind of formation eventually leads to an upside breakout. According to Lang, if Broadcom can rally above $250, he expects the stock will start heading to $300 pretty quickly. Starbucks Corp. (SBUX) is a very profitable company with promising growth opportunities in China, and yet for the last two years the stock price has gone nowhere. In October 2015 it was trading around $56 and that’s where it is today. 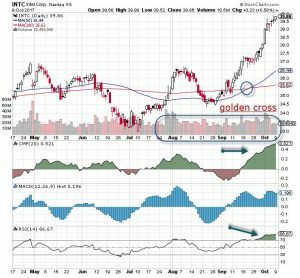 But the stock has been retesting long-term support and the technical indicators are suggesting that it could be preparing for a volatile move higher. After making a new high in October 2015, Starbucks shares began making lower highs above what would become long-term support in the $52 to $53 area, and forming a declining triangle on the weekly chart. A break move above the triangle downtrend line earlier this year briefly made new highs, but then the move reversed direction and the stock price dropped back down to again retest the long term support zone. Since then, Starbucks shares have been consolidating in a small triangle below the $56 level, which is currently intersecting with the long-term triangle downtrend line. But now the daily technical indicators are suggesting that a breakout is coming and it could be volatile. The daily chart shows the small triangle consolidation that has been underway for the last three months. Pattern resistance is defined by the 62% retracement level of the November 2016 low and this year’s high, and also the bottom end of the July gap lower. Those mutual levels of resistance are being tested in today’s session. Daily moving average convergence/divergence is overlaid on a weekly histogram of the oscillator, and is tracking back above its center line on both time frames, which is a sign of positive price and short term trend direction. The Bollinger bandwidth indicator is reflecting a high level of price range contraction, and periods of low volatility like this have, in the past, been followed by periods of high volatility. This was the case before the spike in the stock price in May and the drop in the stock price in July. The Chaikin money-flow reading is neutral and that will have to improve to support a rally going forward. Southwest Airlines (LUV) is following the Fibonacci script. In September, it bounced off the intersection of the 50% retracement level of the November 2016 low and this year’s July high, and the 62% Fibonacci fan line of that rally range. Fan lines are trend lines that extend from the trough low of the Fibonacci range through the different retracement levels. 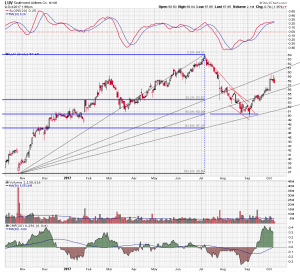 The stock continued its advance and now is intersecting with the Fibonacci fan line drawn from the start of the rally and through the 38% retracement level. 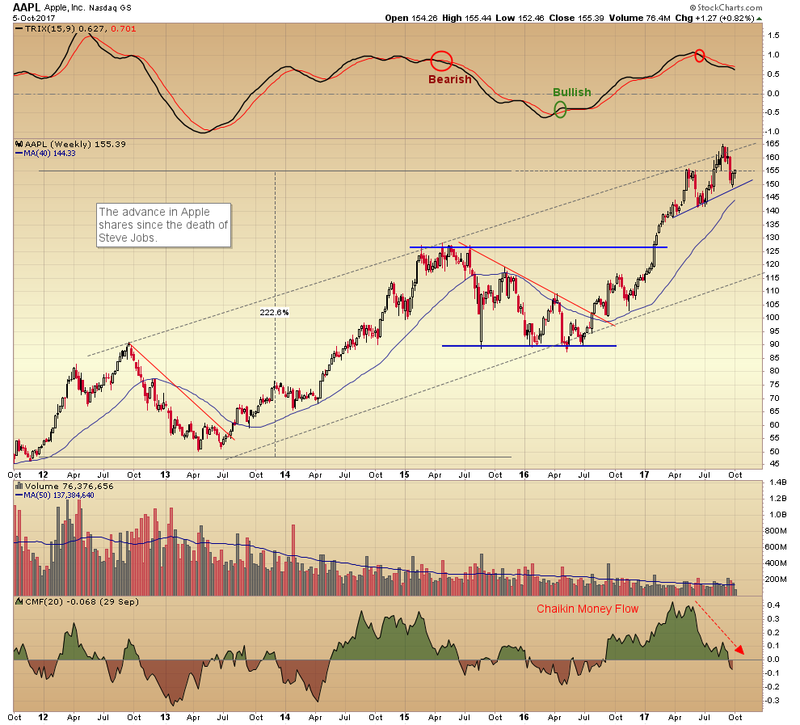 A pullback may be in order, and the 50% fan line currently in the $56 level is the first area of support. Scott Gamm of TheStreet.com interviews Ron Orol from The Deal on the P&G proxy fight. Procter & Gamble (PG) shareholders will vote tomorrow to decide the biggest proxy battle in history. Nelson Peltz’s Trian Fund Management is fighting for a single seat on the P&G board and the company is fighting back. A combined 60 million is being spent to influence largely individual shareholders. P&G is relying on its record over the last several years to sway voters. Shares are up 24% over the last two years, outperforming the Consumer Staples Select Sector SPDR Fund (XLP – Get Report) and the S&P 500 index in that time. It pulled back from its recent all-time highs and is attempting to hold above its 50-day moving average. 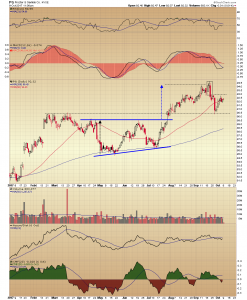 Let’s take a look at the P&G chart and see what the technical indicators are saying about the future direction of the stock price and potentially the outcome of the vote. 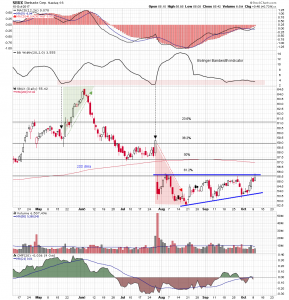 The stock broke out of a large triangle pattern in late July and continued higher. By September, it had completed the pattern price objective of the triangle, measured by taking its height and adding it to the triangle breakout level. After achieving this price objective, an eveningstar pattern formed on the chart. An eveningstar is a three-day bearish reversal pattern that consists of a strong up day, followed by a narrow opening and closing range “doji” candle, and completed by a large down day. It represents a transition in investor sentiment from bullishness to bearishness. The stock price headed lower before finding support last month in the $90 area, the former February and March highs. It managed to bounce off this level and has returned to its rising 50-day moving average. Daily moving average convergence/divergence is overlaid on a weekly histogram of the oscillator, and is trending lower on both time frames. This represents a loss in positive price momentum and negative short-term trend direction. The relative strength indicator is tracking lower and is below its center line. 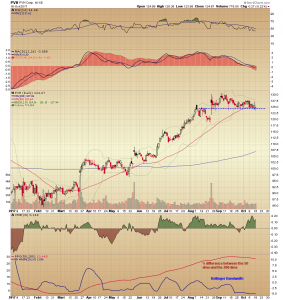 Chaikin money flow has been headed lower since the formation of the eveningstar pattern and is now in negative territory. The technical indicators are more reflective of the September decline and have not fully factored in the October bounce, but the short-term trend is lower. The vote Tuesday may be a fundamental catalyst that either takes the stock price back above $93.00 level, which would be bullish over the intermediate term, or sends it lower confirming the current technical indications, which would be bearish over the intermediate term. Spot copper prices spent the first six months of this year moving lower below a declining trend line. In June they broke above that resistance and rallied 21% to their early September high. The bullish trend quickly reversed direction and was followed by a pullback to the 38% Fibonacci retracement level of the rally range. After several weeks of consolidation around the 50 day moving average there was a jump in the spot price last week. But at the same time there was a bearish diversion on the Freeport-McMoRan (FCX) chart, and it may be suggesting that there is more consolidation ahead for Dr. Copper. 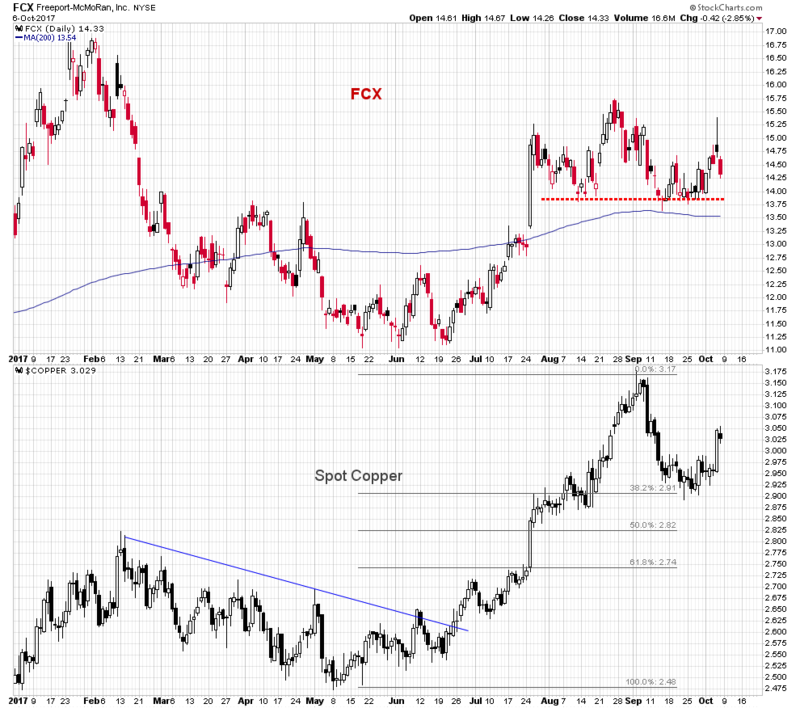 Last Thursday the spot copper price rallied but a large high wick shooting star candle formed on the Freeport chart. This shooting star candle represents a failure to hold a higher price level and a potential reversal in trader sentiment. On Friday the spot price was little changed but a large dark candle formed on the Freeport chart, confirmation of the previous bearish reversal candle. 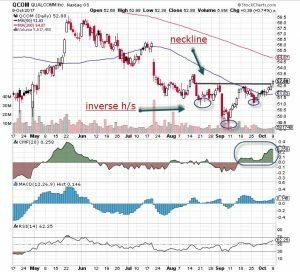 Freeport shares have been forming a head and shoulders pattern for the last two months, above neckline and 200 day moving average support in the $13.75 to $13.50 area. It looks like this support zone will be retested this week. The four month rally in copper saw the spot price up over 27% from trough to peak and Freeport shares up over 40% in that time. September’s pullback was healthy but it might not have been enough of a retracement for the markets to absorb those gains and re-energize buying interest, as the recent bearish diversion between the stock price and the spot price suggests. 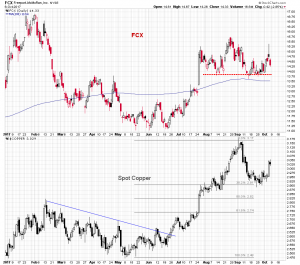 The stock of the copper miner should follow the spot price of the metal, but in this case, the FCX chart looks weaker than the copper chart looks strong. The legacy of Steve Jobs is much more than the catalog of Apple (AAPL) devices he helped design and market. It is the ecosystem he envisioned, one that has taken access and connectivity to a new level. legacy that Steve Job’s leaves behind. Thursday was the six-year anniversary of his death and a good time to take a look at how Apple stock has performed since his passing and where it might be headed going into earnings next month. Apple shares are up 223% since September 2011, in no small part due to the guidance of Tim Cook, whose job it was to run one of the largest market cap companies in the world and, at the same time, ensure the harmony of the ecosystem. The advance, however, did not come without meaningful pullbacks and the highs and lows in the stock have formed a long-term rising channel. The stock is currently retesting the upper channel border and there are some indications on this time frame that another pullback may be underway. 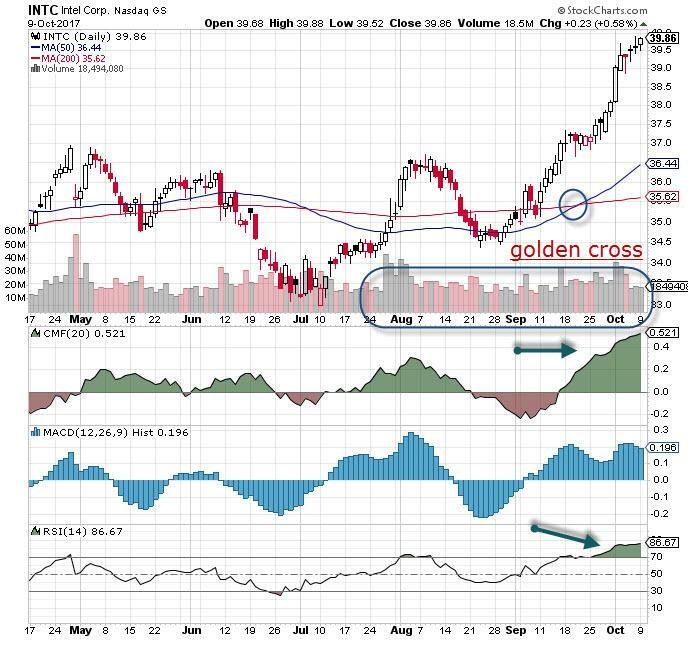 The TRIX is a triple-smoothed momentum indicator similar to the moving average convergence/divergence oscillator, and it is making a bearish crossover. Chaikin money flow has moved into negative territory, which supports the pullback thesis. Apple shares reversed direction this month and started heading lower. They dipped down to $150 to fill an open gap, and then bounced back up to their previous May high in the $155 area. This level has been solid resistance for the last two weeks, despite a broadly positive market. Thursday the $155 level is being tested again and a close above or below it could determine the intermediate-term direction of the stock price. The stochastic oscillator is moving higher and out of an oversold condition, suggesting a short-term bounce, but the Chandre Trend Meter, which assigns a numerical value to a trend using several different moving averages on six different time frames, suggests the trend is neutral to lower. 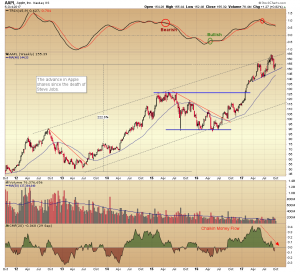 The bottom line is that for the last six years, Apple has been in a primary long-term channel uptrend, interrupted by several significant pullback periods. 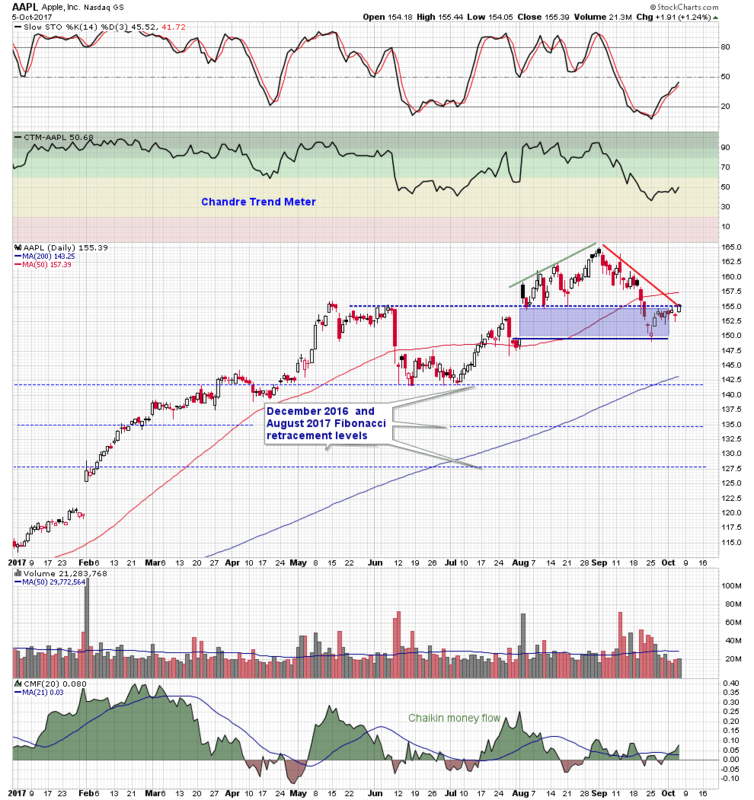 At present, shares are testing short-term resistance near the top end of the long-term channel. It is certainly possible that shares retest the channel top, but the inference drawn from the trend and money flow indicators is that any strength will be short lived and that Apple shares are preparing for another pullback phase, which could potentially take them back down to the $115 weekly channel support line.